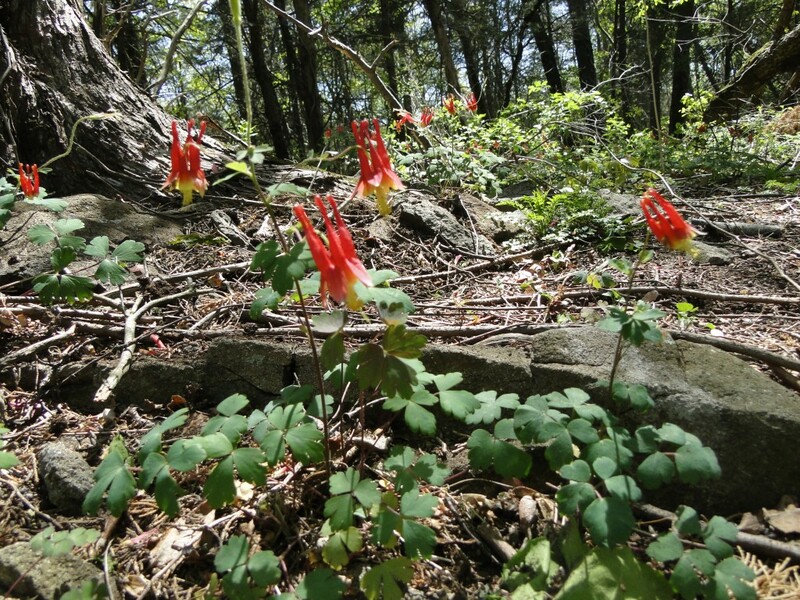 Red columbine grows in mineral -rich soil on rocky outcroppings. This thriving population was identified in Rocky Hill, at a site to become a shopping center. The plan was adjusted to preserve most of the knoll, not grade it away. My much-loved, old, heavy botanical manuals (e.g. Fernald and Britton and Brown) always include a sentence or two about the habitat where a plant is found, as well as exceedingly detailed morphological descriptions. “Found in rich soil” is a frequent description that can apply to fallow farmland, alluvial floodplains, a bouldery forest at the base of a hillside, or a rocky summit with two inches of mineral-rich soil , covered with red columbines. I used to think rich soil was rich soil, no matter where it was, with other ecological factors making the plant communities so different from each other. But I’ve learned that is only partly true. A fallow, fertile crop field supports a rank stand of annual weeds like pigweed, ragweed, and giant foxtail, that have the genetic capacity to grow tall in response to high levels of the three basic nutrients (especially nitrogen, but also phosphorus, and potassium). The field produces abundant birdfood, but weed competition excludes all the wildflowers and ferns than are genetically programmed to stay short for their whole lives. Frequent plowing also excludes native perennials. Soils may or may not be “rich” in ninerals like magnesium and calcium. The probability of finding rare species is very low. The dominant understory vegetation in a “rich” floodplain of a large river is also thick and lush, mostly annuals like jewelweed and false nettle, though flooding and ice, not plowing excludes perennials. Frequent deposits of fresh silt and organic matter provide an abundant supply of the three, basic common nutrients. Especially if the watershed has traprock ridges, alluvial soil is also rich in other minerals like calcium, magnesium, and manganese, and subacidic. Such soil is well-suited to late-season farming. It also can support uncommon, minerotrophic (mineral-loving) plants, where growing space and light is available. Floodplain annuals start growing only after floodwaters recede, and tree falls and thick deposits of sediment often open up new bare soil patches. 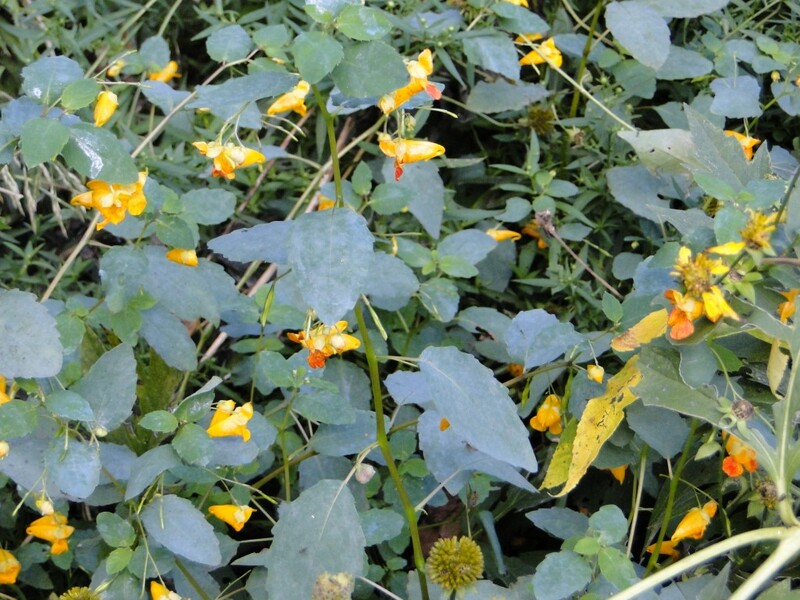 Jewelweed is dominant in alluvial soil with shale gravel, along Stocking Brook , in southwestern Berlin, Connecticut. I have found delicate wildflowers only in early spring, before they are shaded by the rank annuals. Dutchman’s Breeches (Dicentra cucullaria) and spring beauty (Claytonia virginica) do grow on the banks of the Farmington River in Simsbury, with much traprock in its watershed. I also know a few rare floodplain sedges, like Davis sedge (Carex davisii), with a vigorous, tall growth form, that can compete with the dense floodplain annuals – though not invasive shrubs like Euonymus alata. Do these uncommon floodplain plants need soil with high concentrations of minerals, with or without high availability of nitrogen, phosphorus and potassium? Has any research on this been published? Another place to find “rich site” wildflowers, ferns and sedges in Connecticut is the base of a hillside, among the boulders. Soil water at the base of a hill has been seeping slowly downhill for hundreds of feet,and for many centuries, dissolving minerals from the surfaces of soil particles and rocks. Topsoil has also slowly washed downhill over the centuries. Slope-base soil typically has ample minerals and enough of the three basic nutrients, and is moist as well. Stately bottomland trees grow in this rich, rocky soil: sugar maple, red oak, tulip poplar, ironwood, and occasional basswood. Spring ephemerals like red trillium (Trillium erectum) , bloodroot, and trout lily (Erythronium americanum) do most of their growing before the trees leaf out. However, some shade-tolerant minerotrophic plants can keep growing through the summer, like red elderberry and broad beech fern – and other much rarer ones, like Goldie’s fern (which I have yet to find.) 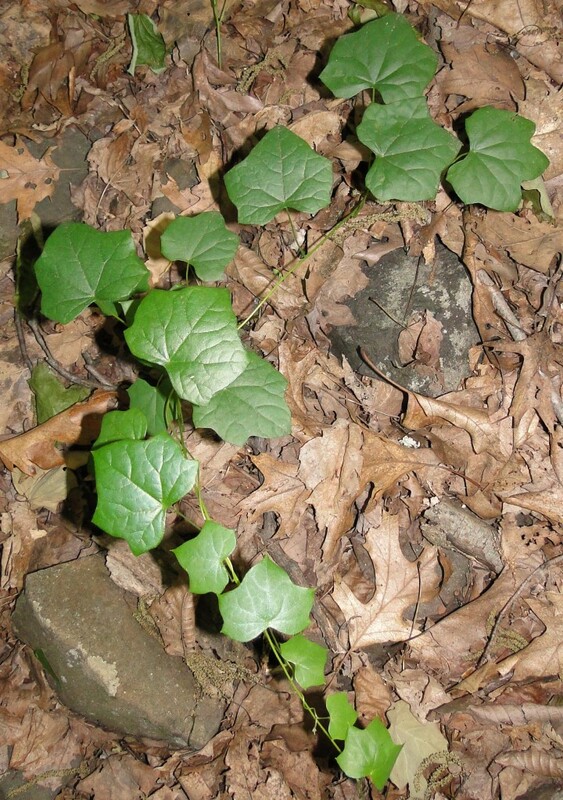 The understory is less dense than in the floodplain, with less competition, and greater diversity. It still rankles me that a Target big box store was built in this habitat at the base of a Meriden traprock cliff, without any ecological survey beforehand. It was over ten years ago, but I still boycott the store! At the base of very long seepage hillsides, soil water has the highest mineral concentrations, and the slope-base plant community is potentially most diverse. The reason is simple, as I was taught by my major professor Ton Damman: the further the groundwater travels, the more minerals are dissolved. I recall an amazingly diverse swamp at the base of a great hill in Winsted, Connecticut, west of Route 8. We measured the nitrogen levels, and they were quite low. Vegetation was low in density and stature, however, not a rank, impenetrable thicket. This allowed diverse, minerotrophic plants to coexist, including melicgrass (Glyceria melicaria), chestnut sedge (Carex brunnensis), and a dwarf raspberry called Rubus pubescens. 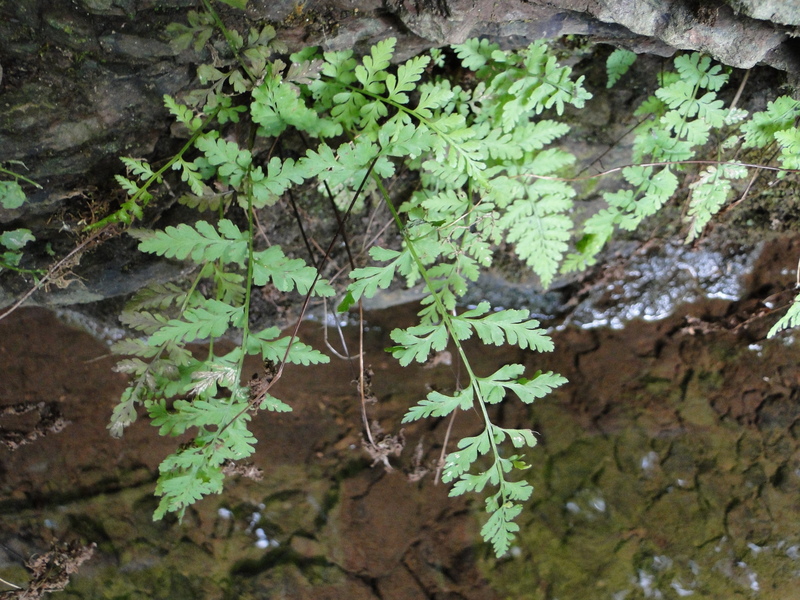 Brittle fern, an uncommon minerotrophic species of rocky habitats is growing out of a shale rock face along an incised stream , Stocking Brook in Berlin, Connecticut. Characteristic plant species, uncommon in other habitats, as well as truly rare, state-listed species, are also often associated with ledges, outcroppings, and crevices of rock formations, regardless of bedrock type. Botanizing is always rewarding in such habitats! I often find red columbine (Aquilegia canadensis) on traprock summits, but sometimes also in areas with a metamorphic outcrop of gneiss or schist. Dwarf saxifrage, Dutchman’s Breeches, Canada moonseed (Menispermum canadense), and red elderberry (Sambucus racemosa), and brittle fern grow at the base of a low traprock cliff near Kensington Road in Berlin. The first four species I often see in undisturbed trap habitats, but rarely elsewhere. The brittlefern (Cystopteris fragilis) is rarer, but less tied to traprock. The only orange-fruited horse gentian (Triosteum aurantiacum) I have ever seen was at the base of a sandstone shale rock face, but they have also been found on coastal bedrock outcrops in Branford. Rare prickly pears (Opuntia humifusa) have been found in Old Saybrook on bedrock outcrops on “The Preserve” property; this is probably because the open, southern exposure mimics the warmer growing conditions at the center of its range., and may – or may not – be also related to mineral-rich soil. Seedling of a Canada moonseed vine, in moist, rich soil at the base of a basalt rock face; north end of Cathole Mountain, Kensington Road, Berlin. The term minerotrophic is widely used, but solid data is lacking as to exactly which minerals are needed by which plant species, and at what levels. What are the relative roles of microclimate and soil mineral needs, as they affect plant distributions on rocky summits and outcrops? How often is the distribution of a “rich site” species limited, not by soil composition, but rather by competition with other plants? Many uncommon plants are known to be characteristic of rocky habitats. How often is this due to the role of rocks and boulders in reducing competition, rather than mineral availability? To what extent are “rich site” plants found along slope bases or on “rocky site” plants on summits because the areas were historically too bouldery for farming, so that the plants remain there, but were long since eliminated elsewhere by agriculture? A telling comparison is the nearly pristine, and botanically diverse, forested north slope of the traprock ridge at Dinosaur State Park, versus the depauperate east slope, which has been farmed for over a century. Parts of this this field are infested by invasive Japanese barberry and burning bush, and the dominant ground cover is the prickly dewberry, a very common dry-site plant. But even this field, also supports populations of uncommon plants like Carolina rose and panicled bush clover, growing in sweet (subacidic), mineral-rich soil with traprock near the surface. These are opportunities for interesting ecological research! We really have not advanced very much past the “rich site” or “rocky site” habitat characterizations in the old botany manuals. This entry was posted in Botany, Invasive Species, Soils, Wildlife Habitat and tagged lemmon@snet.net, rema8@aol.com. Bookmark the permalink.